New at Statistically Funny: Just how objective are numbers? Statistics - where words and numbers combine to form a fresh sort of hell! Making sense of some key effect measures: ARR OR NNT? What's your number needed to confuse? The damaging Tim Hunt saga keeps rolling on, with outrage about the outrage too. I tackle the complex issues of outrage, feminism, social media, and social movements over at PLOS Blogs in The Outrage Factor - Then and Now. And I've published my own personal analysis of the reaction in case it's helpful to others - A Tim Hunt Timeline: Cutting a Path Through a Tangled Forest. Earlier in the month, I took the opportunity of a tussle I had with The Times over what they called a "survey" to look at bias - and make full use of the excuse to encourage watching a great clip from the glorious Yes, Minister: check it out! 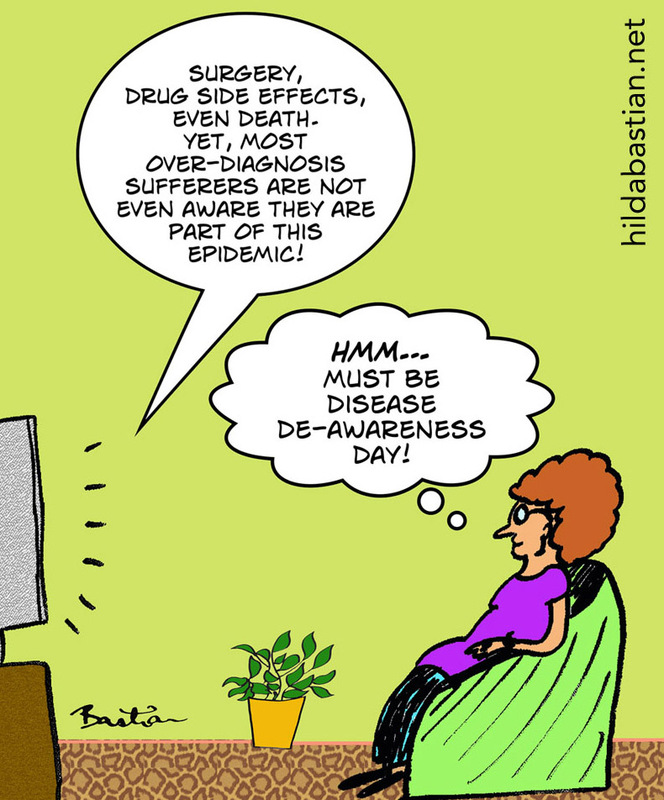 A social movement of a very different kind was also on my mind at MedPage Today - the evidence-based medicine movement ("EBM"). Fervent single issue re-branding of the whole of medicine has perils, and so do social movements. 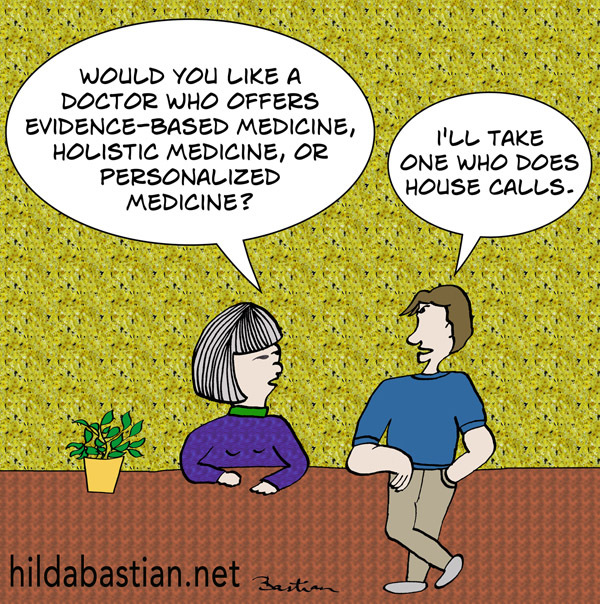 EBM hasn't managed to avoid them: The Trouble with Evidence-Based Medicine, the 'Brand'. I was interviewed about research ethics and the chocolate hoax trial for radio in Science for the People's show on human research ethics. Wave after wave of scientists behaving badly. At PLOS Blogs, in the wake of the Tim Hunt event, I look at the research on sexist humor and reducing sexism: "Just" joking? Sexist talk in science. And a sequel to a popular post from 2014: Another 5 Things to Know About Meta-Analysis. 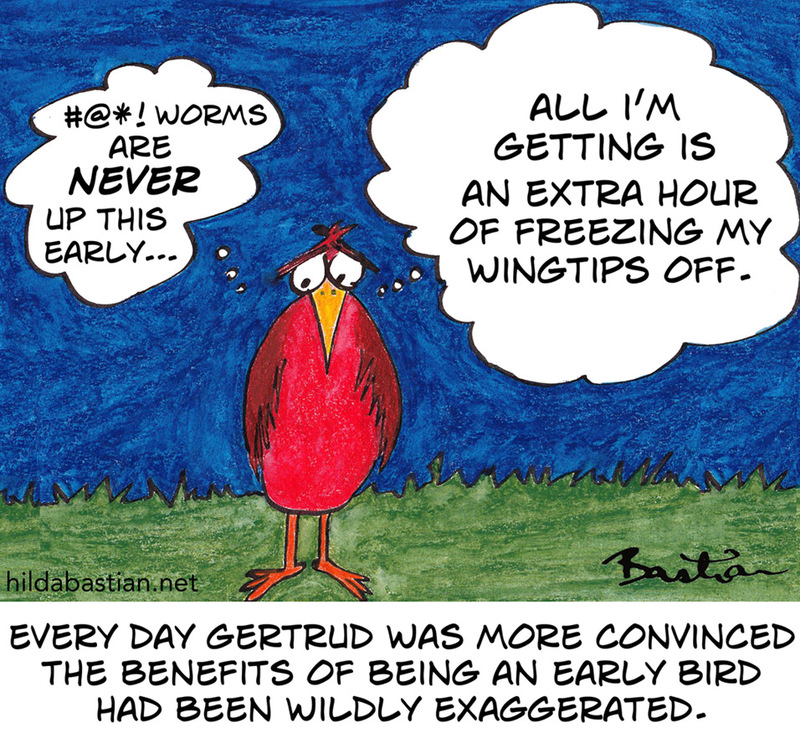 On Tumblr, Gertrud got a makeover: my most popular cartoon, on the dubious benefits of being early plus another old favorite: women and children first? And is a world without bias too much to ask? 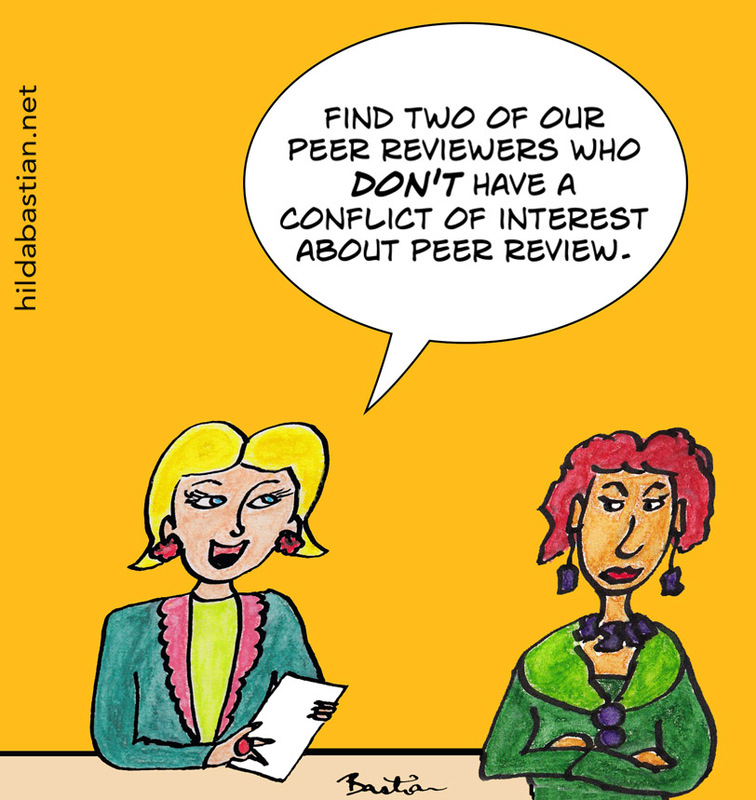 First up this month on PLOS Blogs, I tackled peer review again: this time, weighing up anonymity and openness in publication peer review. I found 17 relevant comparative studies, most of them controlled trials - as well as the blog post, I added them to a comment on PubMed Commons. Then something I sure didn't see coming: some journalists decided to do a trial of chocolate for weight loss as a hoax to expose corruption in the diet research/journalism complex. Mostly, it seemed to me, they showed failures of medical and journalist ethics, and their own conflicts of interested. My post is called, Tricked: the ethical slipperiness of hoaxes. And on Tumblr, the most misunderstood and misused statistical concept of all: statistical significance. On PubMed Commons, I commented on a paper on publication bias in Cochrane systematic reviews. A trip to England, started with speaking at a symposium on reproducibility of biomedical research: my first visit to the Wellcome Trust. And there was a whole lot of tweeting! Next up: Oxford University to join in the exciting Evidence Live conference. You can catch up on that with two posts at PLOS Blogs - including a summary of my own talk: Evidence Live and Kicking (Part 1) and Rifts and Bright Spots in Evidence-Based Medicine. Between meetings, a visit to the Royal Society's exhibition for the 350th anniversary of the first science journal fed into a blog post at PLOS Blogs: Peer Review BC (Before Citation). Continuing on the road to updating old favorites, this month on Tumblr it was all about statistics: all about meta-analyses (and why they so often disagree! ), does it work? 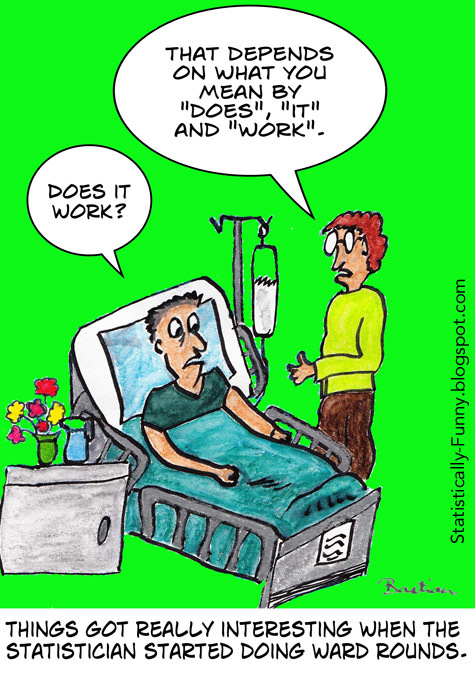 (what would happen if a statistician did the ward rounds), and an epidemiologist's fairy tale: Goldilocks and the 3 Reviews.